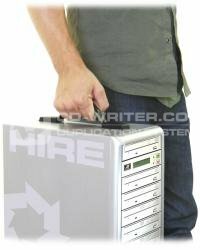 Here is your chance to hire one of our StorDigital DVD/CD duplicators. Ideal for live concert recordings, or for presentations. Have a duplicator where you want it and when you want it. Minimum 4 days hire. We have over 10 units available at any one time. Shipping to you is around £10 per unit. We can also arrange collection from you if required. A full deposit equal to the retail value of the unit is required. We advise you to receive the product a minimum 24 hours prior to required date for testing purposes. To hire your unit please call 020 8293 0777. 7 . Drive . 16X . DVD . CD . Duplicator . for . Hire . £25 . per . day . StorDigital . Systems .